The Blue Poppy Spinner has more of a slow turn than a spin but it serves a purpose. For all of us who find growing the Holy Grail of flowers, the Himalayan Blue Poppy, pretty much impossible...here's the answer. It's a 24" tall metal blue poppy that won't die and comes back every year. The flower is 4" wide...about the same size as the real one. 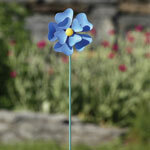 Notify me of updates to Blue Poppy Spinner 24"